Francois Ozon's Potiche (Trophy Wife) opens with a soaring romantic theme, whistled like a merry tune one might sing in the kitchen while cooking breakfast, accompanied by opening credits that are straight out of the 1970s. We are instantly transported back to another time, a different era of filmmaking that has all but disappeared. Potiche a throwback, and while there is a knowing wink to its retro feel, it is completely free of the irony that often accompanies such homages. Beneath its glossy veneer, there is a wholly honest and sincere film. As the credits roll, we are introduced to Suzanne Pujol (a luminous Catherine Deneuve), wife of Robert Pujol (Fabrice Luchini), a wealthy umbrella magnate whose factory has provided them with a high standard of living on the backs of ordinary workers. Suzanne is running through the woods, dressed in a sensible red sweatsuit, and she takes the time to stop and observe the woodland creatures around her, even going so far as to write a poem about a squirrel she sees climbing a tree. She doesn't have a care in the world, and life is simple and easy. Joelle (Judith Godrèche) and Suzanne Pujol (Catherine Deneuve). Suzanne is a trophy wife. A beautiful "kept woman" whose only purpose in life is to appear beside her husband. She doesn't work, she doesn't cook, she doesn't clean, she mostly just exists for her husband and her family, a woman of luxury in a mostly loveless marriage of convenience. But when her husband's workers get sick of his tyrannical ways, they go on strike and take over the factory for themselves. When it becomes clear that a settlement will not be reached while her husband is still in the picture, an old flame and former union leader, Babin (Gérard Depardieu), now a Communist politician, suggests that Suzanne take over the company temporarily until things settle down. But things don't just settle down, they improve. Suzanne proves herself to be a fair and capable leader, and is beloved by all the workers. The factory is running as never before, and when her husband wants his position back, Suzanne isn't sure she's ready to give it up. After all, the workers love her, and for the first time in her life she truly matters. Suzanne is now a strong, empowered, modern woman, and things are about to get very awkward at home as the two of them begin an all-out war for control of the Pujol umbrella company. The Pujols, Nadège and Maurice Babin. With its smart blend of farcical comedy and sharp social commentary, Potiche nimbly recreates not only the 1970s, but the look and feel of a movie from the era as well. It's like stepping into a time warp, but it never feels outdated. Ozon directs with a light and glamorous touch, creating a lush and sumptuous look, from the impeccable costumes to the gorgeous score by Philippe Rombe. 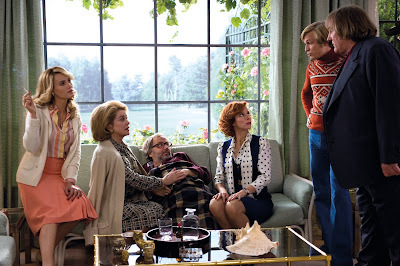 Catherine Deneuve is radiant as always, and much like the character she plays, her considerable charm holds the film together with a sure and steady hand, with Fabrice Luchini and Gerard Depardieu providing perfect comic foils for her newly empowered woman on the go. It would be easy to dismiss the film as an insignificant trifle, but that is precisely what makes it so delightful. While it undeniably has a social conscience, Ozon isn't trying to make the film anything more than what it is - a fun and frothy lark. Potiche is the kind of brightly colored, smartly directed comedies that don't come along often anymore. It's sophisticated without being stuffy and witty without being pretentious - an utterly enchanting homage to the great comedies of yesteryear. 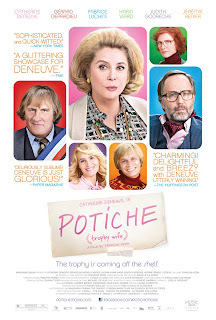 POTICHE | Directed by Francois Ozon | Stars Catherine Deneuve, Fabrice Luchini, Gerard Depardieu, Karin Viard, Judith Godrèche, Jérémie Renier | Rated R for some sexuality | In French w/English subtitles | Now playing in select cities. Opens Friday, May 27, at the a/perture Cinema in Winston-Salem, NC.